This little shop can easily be missed! Tucked away down a tiny alley off of the Bowery is Extra, an eclectic man-themed clothing boutique. Shop owner and collector, Koji Kusakabe, features his fabulous assortment of curious 20th Century vintage collectibles along with Post Overalls / Post O'alls, a small-run, vintage-inspired menswear line, produced in the U.S.A. by childhood friend, Takeshi Ohfuchi, who has modernized the American vintage garment while maintaining its classic quality and detail. Monday, Wednesday, Thursday + Friday: 12:00 p.m. to 7:00 p.m.
Saturday + Sunday: 1:00 p.m. to 7:00 p.m. The inspiration behind the shop's name, "Extra," comes from the happy coincidence of shop owner, Koji Kusakabe's long time business name, "One More," and the name of the street where he would open his business, "Extra Place." "One More" is synonymous with "Extra," and the name of the street has "Extra" in it, and it is due to this synchronicity that he decided to name his shop "Extra." With so many wonderful boutiques to stumble upon in New York City, there is a greater chance of a thief returning your lost wallet (with the cash in it), then happening upon Extra, a small shop tucked away down a tiny alley off The Bowery. When looking down the secluded alleyway, there is no directory, no protruding sign, only a wall of large plate-glass windows fighting off the sun's glare. Hidden behind one of these glaring panes is Extra, a unique find for the shopper who is craving something different. 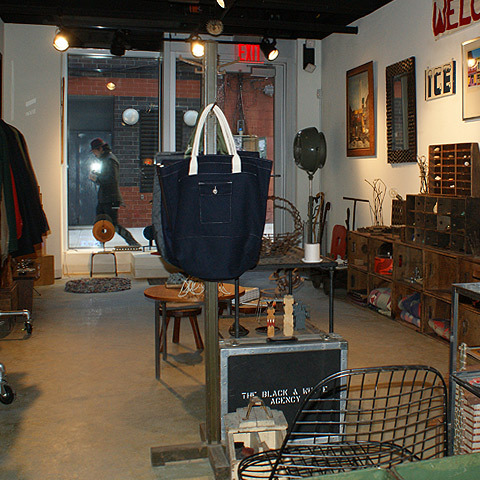 The majority of the shop's contents are quirky, manly one-of-a-kind 20th Century collectible gadgets, interior decor and conversational pieces, paired with Post Overalls, a vintage-inspired men's clothing line made by Kusakabe's childhood friend, Takeshi Ohfuchi. The new and the old exist side-by-side, complimenting one another with their edgy similarities. It's like peeking into the life of the visionary clothier and the private collector's secret stash. Koji Kusakabe, a former vintage dealer is unlike any serious art collector, who purchases things for the pure investment, Kusakabe describes his buying habits as "whatever he finds interesting." His taste is particularly fascinating. The majority of the objects for sale are select pieces curated from his private collection dating back to early and mid-20th century American. Early working timepieces along with German and American cameras are among but a few of the charming things to shop for. Casually displayed throughout the boutique are authentic early American Indian artifacts that include arrowheads, beautiful hand-woven blankets, souvenir spoons, and totem pole charms dating back to the 1930's. Decorating the walls are electric world time clocks, outdoor street signs, and retractable educational wall maps. Fashion gurus will be moved by the early 60's and 70's new-old stock, vintage sunglasses (France, Italy & USA) — one brand is claimed to have been made by the same company who had fashioned frames for music icon, Elton John. With it's museum-like quality, shoppers are taken on a walk back in time, perusing a little bit of everything from Folk Art objects to old toy Buck Rogers space guns. In contrast to Kusakabe's shebang, is Post Overalls, with more than meets the eye. Clothier, Takeshi Ohfuchi has been a serious lifetime collector of vintage work wear. Since 1993, he has been producing the brand Post Overalls, a men's clothing line influenced by his passion for American vintage work wear. He has recreated the all-American vintage feel, styled for the modern man, right down to the fine quality and subtle details. Pants, shirts, shorts, outerwear and tote bags are all manufactured in the U.S.A. as authentically as possible, using all-American fabrics sewn on period machines — recreating a long-lasting garment with true vintage construction, unique to vintage wear. The line is consistently produced biannually in it's familiar distinct style, updated with seasonal fabrics. In the past, Ohfuchi has created double-label lines for Comme des Garçons, and is sought by men who appreciate a classic casual look with vintage detailing and a comfortable fit. On the subject of comfort, there is something comforting about having a relationship with a piece of the past, whether it's a vintage skateboard or a new ultra-cool, period-produced Post Overalls jacket. Both Koji Kusakabe & Takeshi Ohfuchi have been featured in "Inventory" magazine — a biannual Canadian fashion publication, featuring some of the most inspiring and talented people in the industry (sold at Extra). Despite the little shops barren location, Extra maintains its regular clientele of men with discerning taste.